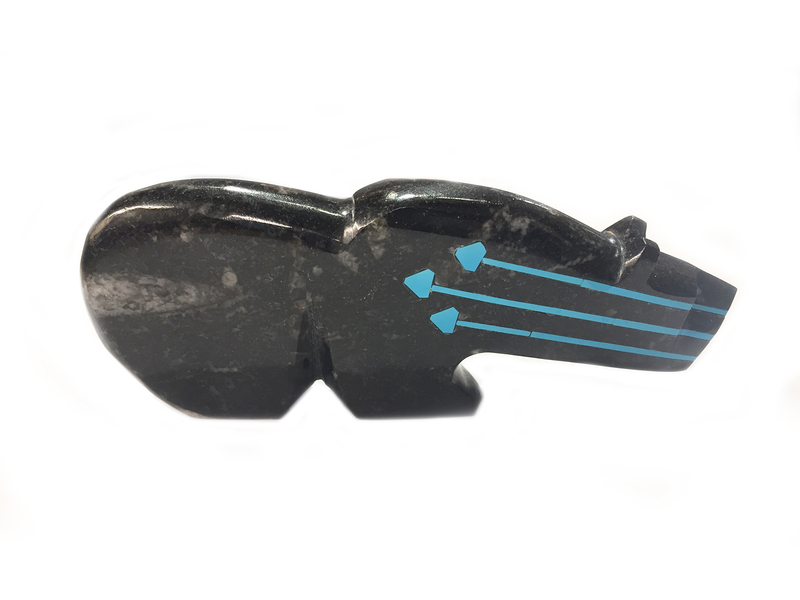 Petoskey Fossil Bear Fetish hand carved by Kenric Laiwakete. Petoskey Fossil Bear Fetish hand carved by the fabulous Kenric Laiwakete. 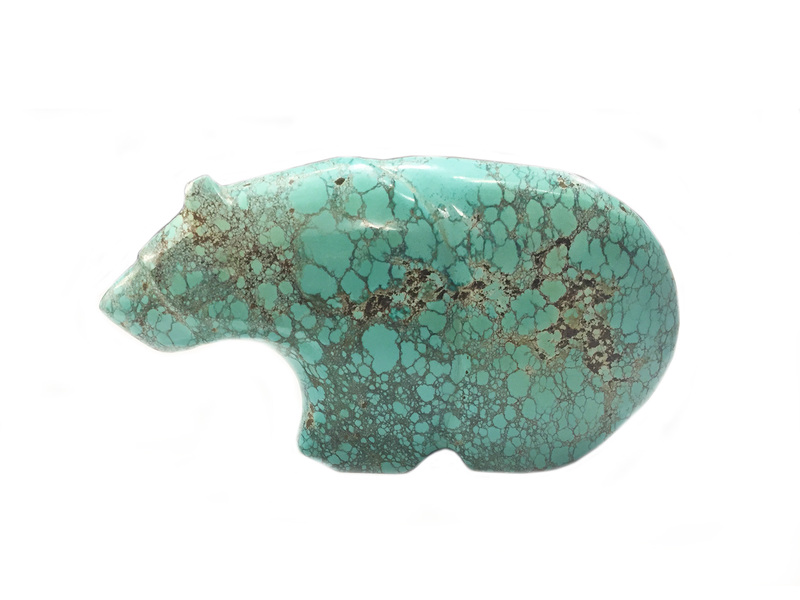 This striking bear fetish is carved from petoskey and features 2 turquoise inlay heart lines. The bear is 3″ inches high and 4 1/2″ inches long. Kenric Laiwakete is a young Zuni fetish carver who is part of the noted Laiwakete family of Zuni Pueblo fetish carvers. Kenric’s father is Bernard Laiwakete and his uncle is Donovan Laiwakete. Kenric’s father and uncles, including Donovan, Rodney, and Tony all helped Kenric learn the trade of Zuni Fetish carving. A Petoskey stone is a rock and a fossil, often pebble-shaped, that is composed of a fossilized rugose coral, Hexagonaria percarinata. Such stones were formed as a result of glaciation, in which sheets of ice plucked stones from the bedrock, grinding off their rough edges and depositing them in the northwestern (and some in the northeastern) portion of Michigan‘s lower peninsula. 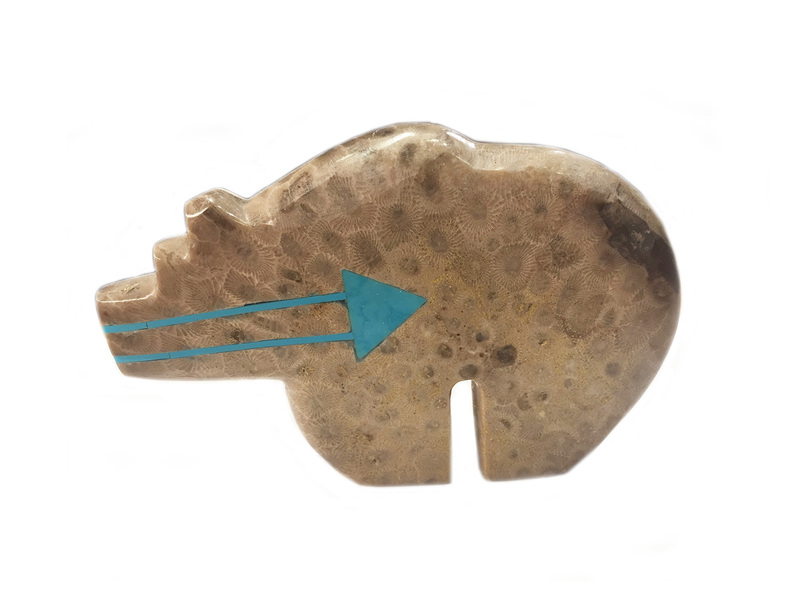 In those same areas of Michigan, complete fossilized coral colony heads can be found in the source rocks for the Petoskey stones. Petoskey stones are found in the Gravel Point Formation of the Traverse Group. They are fragments of a coral reef that was originally deposited during the Devonian period. When dry, the stone resembles ordinary limestone but when wet or polished using lapidary techniques, the distinctive mottled pattern of the six-sided coral fossils emerges. It is sometimes made into decorative objects. Other forms of fossilized coral are also found in the same location. American Indians have used fetishes throughout recorded history, especially the Indians of the southwest. 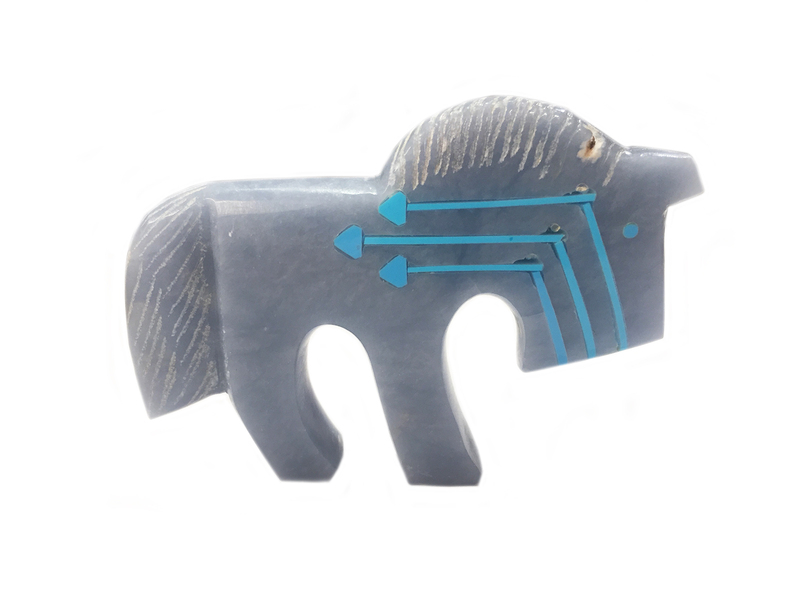 A Zuni fetish is a carving which is believed to have magic powers. Fetishes maybe of any form or material. Regardless of their material however, a fetish has one paramount purpose – to assist man against any real or potential problems which may be those of the mind, the body or the universe. A fetish can be owned by an individual, a family, a clan; a kiva society or an entire tribe. Regardless of ownerships, the care of a fetish is always the responsibility of one person. Special care must be taken to see that the fetish is properly fed, admired and cared for. Fetishes are believed to feed on cornmeal while they are kept in a special pot or pouch. Ground turquoise is often mixed with the cornmeal. A fetish is made and “decorated” with turquoise, arrowheads, coral, etc. as a means of adornment. This adornment is a show of affection and appreciation by its maker and/or owner. The better treatment a fetish receives, the better performance it is likely to provide. Most fetishes relate to animals of prey. They are acknowledged as the most powerful providers in life, so they are likewise accepted as having the greatest powers. They are generally admired for their strong hearts. Many believe the strong heart makes them dominant and therefore, survivors; the hunter rather than the hunted. The Zuni Indians of New Mexico believe strongly in six cardinal guardian fetishes. Each is symbolic of a direction and has its own specific color. The guardian fetish of the north is the mountain lion (yellow); the south (red) is the badger; the west (blue) is the bear and the east (white) is the wolf. Additionally, the mole is the guardian of the nadir or inner earth (black) and zepath is the eagle (all colored bird forms) guardian of the skies. Bear Strength, Introspection, spiritual journey though life. The white bear is medicine. Owl Can see what others can¼t, essence of true wisdom. Protector of the home.